This week I have the pleasure to share with my readers some teen resources for therapists to use with their clients. 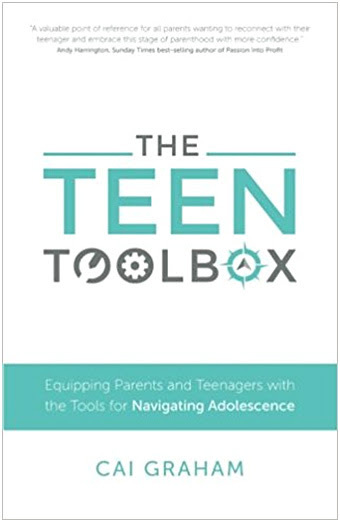 Today’s feature is a workbook I use with my teen clients and their parents, The Teen Toolbox written by Cai Graham. In this article, I will be sharing information about the book, my own review, and how to purchase a copy of it for yourself. Cai Graham is a past Business Graduate and successful IT project manager turned therapist. She felt inspired to facilitate transformation for parents and children and has blended her 20+ years of mothering with her skills as a therapist, coach and photographer to create an online education program, a book, and one of a kind luxury retreats for families looking to reconnect, understand and relate with each other better. Cai’s ultimate driver is to empower Parents and Young People with the skills to communicate effectively and find confidence to live full, happy and healthy lives. To learn more about the author visit her page here. Welcome to the incredible toolbox for therapists serving teens and their parents. In this book, Cai explores the common scenario of parents truly struggling with their teens because they do not know how to communicate with them. Parents don’t come home from the nursery with a user manual. The reality is as the kid gets older the parent often does not intuitively know how to navigate the vital stages of relationships and feelings. This often results in parents who feel enabled rather than feeling joy about parenthood and all its journey. * Techniques that will help the parent and their child overcome common issues If they’re looking to reconnect, understand and relate with their teenager better, you need to read this book. It can help you make deeper connections with your clients and their families. I thought the design and color scheme of the cover was catchy enough that parents would pick it up if they saw it sitting on a shelf. As a parent I know I would not pick up a book if it didn’t look like it would be easy to read. One thing I pay particular attention to is the font size because I read a lot and my eyes begin to hurt. The Teen Toolbox has a decent font size so I don’t need to worry about eye strain. The pages aren’t too cluttered, making it more likely a parent might read it. I loved the book’s mission to help parents bring back the love, respect and trust between parent and teen. Ultimately the best way to ensure open communication with teens is to ensure a positive parent-teen relationship and this book is teaching how to have a healthier relationship with your teen. For Parents- the content is a valuable point of reference for parents wanting to reconnect with their teenager and embrace this stage of parenthood with more confidence. It is a great self-help resource for families wanting to learn ways to address common problems such as poor communication, lying, sneaking out and breaking rules. It is a great resource to teach and model respect, trust, dignity, and to learn alternative ways to communicate frustrations and provide alternative ways to discipline. For therapists – the content is deep enough that a therapist can break the content into sections to cover at each session or even have each chapter spread out over several sessions. The book gives ideas for homework to allow the client opportunity for self-discovery. The content is broad enough for therapists to incorporate their theoretical framework and their lens to ensure preferred Evidence Based Practices are incorporated into each session. Great for teen resources for therapists, therapy resources for teens, simple teen-parent worksheets, teen worksheets. Oooo what a helpful resource for parents and teens!!! So much valuable info for both! This seems like an awesome book! Thanks for sharing, this can help so many people! If you’d ever like to guest blog on my mental health blog, let me know! Seems like a great book, Thank goodness we aren’t there yet with my kids but going to look into getting it for later! I am so glad you decided to share this, I’m sure it will benefit so many people! Access to appropriate resources can be life saving – keep up the good work! This looks like a very awesome tool for parents. Parenting a teenager takes work and dedication to stay connected. Great review!